Her luck had turned sour and curdled even as the abundant supply of sweet, nourishing milk sprayed from her breasts and was gulped down by the two little cherubs in her arms. Really, it didn’t surprise her, because for years her wishes bore fruit. She liked to believe her luck involved a bit of magic from the gnarled pomegranate tree that she and her husband had made love under one desert night. 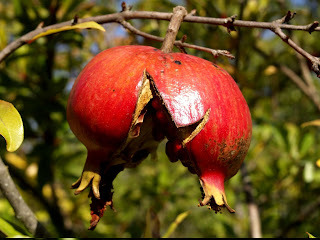 They fucked each other so hard the fruit fell from the tree and onto their heads, but they kept going, their sweaty bodies rolling over and squashing pomegranates, staining them red. And when they were done and lay staring up through the tree’s branches at the ocean of stars, she licked the juice from her arms and nibbled on the jeweled seeds. She liked to believe that for years afterward she carried her husband’s seeds and the pomegranate seeds inside of her, and that this was why two times her belly grew round and full, skin taut and crisscrossed with pale red stretch marks. That it was the pomegranate tree that gave her three children, and two of them twins (twins! ), when doctor after doctor said there would be none. But if, she figured, there was no magic, if luck were as predictable as the economy’s rise and fall, then she knew her time to plummet had come. And so she fell, tumbling and crashing into the depths of her own hell, the fires burning so hot inside of her that it surprised her that her milk spray wasn’t a hiss of steam that scalded her babies. Prompted by [Fiction] Friday‘s challenge to sketch out a character with wildly bad luck. Make it a character you like, as we will use her again.